Responsiveness to electoral opinions is one of the hallmarks of democratic governance. We focus on a particularly strong type of unresponsiveness, viz., one where the complete inversion of all preferences in the electorate is accompanied with no change in the electoral outcome. It is known that the possibility of this extreme type of unresponsiveness, known as the Preference Inversion paradox or Reversal Bias, is associated with many voting rules. We set out to find out whether the paradox can be encountered when using various procedures under a restricted Condorcet domain, viz., one where a Condorcet winner exists and is elected by the procedure under study. Assume that a strong Condorcet winner exists in the initial profile, i.e., an alternative which is ranked first by an absolute majority of the voters. Is the Plurality Voting procedure vulnerable to the Preference Inversion Paradox in such a domain? What about the Plurality with Runoff procedure? Suppose that this electorate is augmented with a set of voters whose preferences “cancel out” in the sense that half of the augmented set has some given ranking over the three candidates and the other half has the reversal of this ranking. Can z be rendered the Plurality winner by adding such a set of voters? If it can, describe the profile. If it cannot, explain why this is impossible. What happens to the Condorcet, Plurality Voting and Borda Count winners when the original profile is augmented with these four voters whose preferences cancel out? Consider the profile devised by Saari and Barney presented in Sect. 7.1. Compute the positional sum scores and the ensuing collective ranking of x, y and z when w2 = 2/3 both in the original and inverted profiles. Considering again the same profile, compute the positional sum scores and the corresponding collective ranking for x, y and z when w2 = 1/10 both in the original and the inverted profiles. When there exists a strong Condorcet winner in the initial profile, it is not possible that this candidate would be positioned last in more than half of the electorate. Hence it cannot be the strong Condorcet winner in the reversal profile, but it can be the last ranked by more voters than any other candidate in the initial profile. 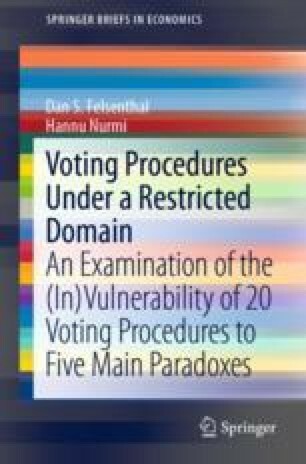 So, the Plurality Voting procedure is vulnerable to the Preference Inversion paradox even in the domain considered here. In fact, an example of this is presented in 7.3.1. In the Plurality with Runoff procedure the strong Condorcet winner is obviously elected in the initial profile, but it will be defeated by any other candidate in the runoff in the inverted profile by virtue of being the Condorcet loser there. Hence the Plurality with Runoff procedure is not vulnerable to the Preference Inversion paradox. By adding this subset of voters z becomes the Plurality winner with eight votes. In the original profile x is the Plurality Voting, Borda Count and Condorcet winner. Adding the 4-voter profile results in y becoming the Plurality Voting winner, while x remains the Borda Count and Condorcet winner. By construction, the scores—and therefore the collective ranking—is the same in the original and in the inverted profile. The collective ranking is z > y > x with scores 7, 8 and 25/3, respectively for x, y and z. Again, by construction, the scores—and therefore the collective ranking—is the same in both the original and in the inverted profile. The collective ranking is x > y > z with scores 7, 23/5 and 19/5, respectively for x, y and z.